Let everything that breathes praise the Lord! Praise the LORD in his sanctuary, praise him in the firmament of his strength. Praise him for his mighty deeds, praise him for his sovereign majesty. Praise him with the blast of the trumpet, praise him with lyre and harp, Praise him with timbrel and dance, praise him with strings and pipe. Praise him with sounding cymbals, praise him with clanging cymbals. Let everything that has breath praise the LORD! Alleluia. Lord, you are funny. Just hilarious. You’ve got me today. I swear, if there was one thing I have a hard time with it is forgiveness. And lo and behold, today I have Saint Luke telling me exactly what is hardest for me to hear. I am the ultimate grudge holder and I am ashamed to admit it. This is not the first time I have had to face the facts. It is something I struggle with on the daily. I wish I could be able to say that I have had an epiphany and now I suddenly understand how to be forgiving, non-resentful, and non-judgmental, but I don’t. It is still something I am working on and something I need to improve. But today’s readings gave me a glimpse on how to make that possible and it is pretty simple. Love. Love of Him. Love of them. The Lord forgave me. Me. Imperfect, ever-failing, sinful me. How do I continue to to drag my feet when I have been commanded to forgive? If I spent more time praising the Lord and thinking less of myself, then I should be able to get my act together. When all else fails, love. Love your neighbor. Forgive your enemy. 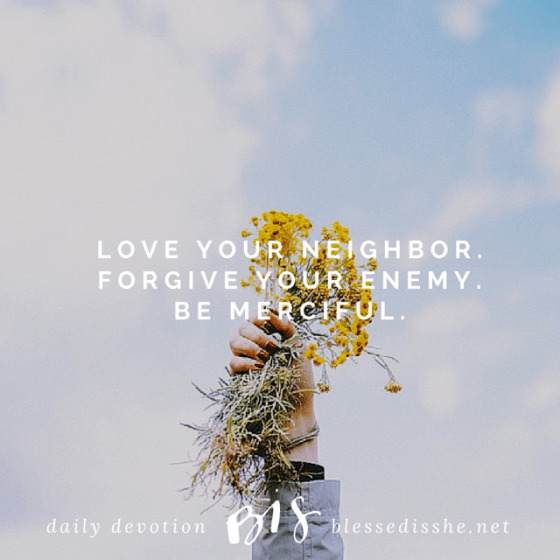 Be merciful. But don’t take my word for it. Scroll right back up there and read. Repeat. Bookmark these readings. Print them out. Put them on your bathroom mirror. Read, and re-read.